The dragon, a symbol of eternity and power in the Chinese tradition, is transformed from paper into glass and light. Six movable cylinders form a lamp with great impact and a strong personality. 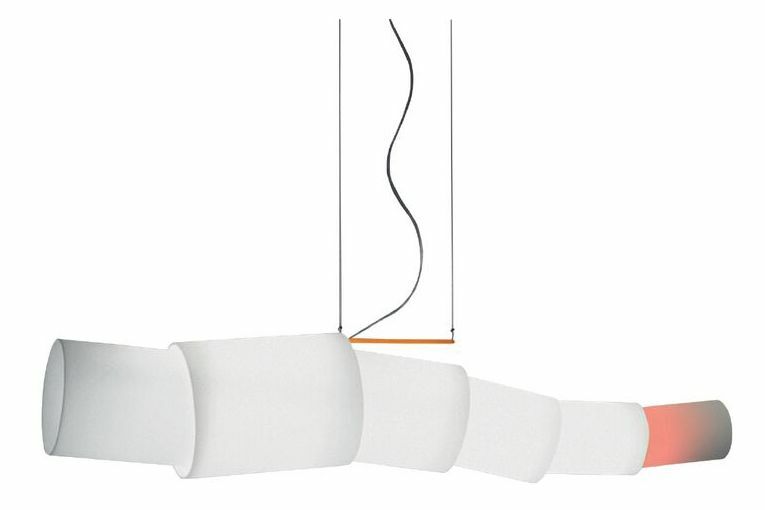 Steel structure; opal blown glass diffuser. In the years of radical and experimental architecture, he was a major player in such movements as Cavart, Alchymia, and Memphis. Designed lamps and furnishing items for the most renowned Italian and European companies. Was in charge of Design at Olivetti from 1988 to 2002, developed experimental projects and conceived a number of personal theories on office development. Designed and refurbished buildings in Japan for NTT, in Germany for Deutsche Bank, in Switzerland for Novartis, and in Italy for Enel, Olivetti, Piaggio, Poste Italiane, Telecom Italia. Has been in charge of requalification of a number of power plants for Enel since 1999. Cooperated to the image development of Deutsche Bank, Deutsche Bundesbahn, Enel, Poste Italiane, Telecom Italia, Hera, Intesa Sanpaolo, and other Italian and foreign companies, introducing technical and aesthetic innovation in work places.